Welcome to the Guild Online. Its 03:00 Tuesday 23rd April 2019 , UK time. Enjoy your visit, come back again soon ! We have a new venue for this years AGM, please see the following notes regarding attendance at this site, thank you. This is the new venue for this year’s AGM event. We have booked the rally field for the above dates. All those wanting to attend will have to phone their booking through to the above phone number. Bookings should be made asap but no later than 23 June. Please remember to let the camp site know you are attending the Guild AGM. All camping fees are to be paid on arrival – cash only. (1) Our Magazine 'News & Views' Issue 95 is out now. The next issue (96) will be going to press on 1 April. Future Mags are awaiting articles from YOU ! So if you have any show reports, Cars the Star articles or technical tips please send them in, email or post by 25 March. You can contact the Mag Editor at the Guild email address or the postal address shown on page 2 of the Mag. (2) The 2019 Guild 25th Anniversary Calendars have now sold out. (3) How about telling us about your Granada ? Send some details (brief notes on a scrap of paper will do) and maybe some pictures of your Granada for the Magazine. Send details and pictures to our Editor John Kempson. (4) How to register a historic vehicle with the DVLA an informative article by John Kempson. Click here to read more and download the forms required. See the Mag for a list of shows and events. If you have any details of shows in your area, please let us know so we can include them in the next events list. Thanks. A very warm 'welcome' to all our recent new members, we look forward to meeting up with you at our shows and events very soon ! Interested in joining a long standing Granada Club (established 1993), that has national and international connections and membership ? For information and fee's see our Membership page. For general information and enquiries, please use our contact form to get in touch. Thanks ! The Consul/Granada large car range was introduced in 1972 as the replacement for the Zephyr/Zodiac. Both the Consul and Granada shared the same modern bodyshell, the production started in December 1971 and continued until September 1977 when Ford announced its new Granada with cleaner, more elegant body style and featuring German built engines. Ford dealer Harold Perry Motors in conjunction with Broadspeed turned this already fine car into something special. Read about the Mk2 Broadspeed Turbo Granada . 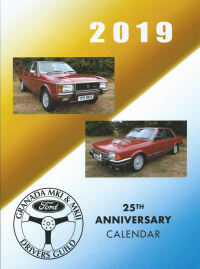 . .
Want a Mk1 or Mk2 GRANADA of your own ? Click here for our Sales/Wanted page. Tell us your favourite Granada in our Online Poll. Page last updated 19:15 Tuesday 16th April 2019 . If you experience any problems with this website please contact the .